All the information here is taken from this BLOG, the only thing I did was add pictures to make the directions clearer. The first thing to do is add two iSCSI Targets to the Storage Server. 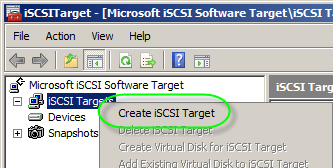 To do this, right-click the iSCSI Targets node in the Microsoft iSCSI Software Target MMC and select the “Create iSCSI Target” option. 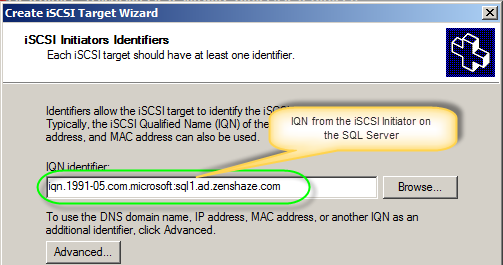 You will then specify a name, an optional description and the identifier for the iSCSI Initiator associated with that iSCSI Target. If this is the first time you started it you will see a prompt to turn the service on, click yes. 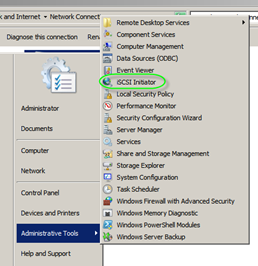 Right-click the “Devices” node in the Microsoft iSCSI Software Target MMC and select the “Create Virtual Disk” option. For each Virtual Disk you will specify a filename (complete with drive, folder and extension), a size (between 8MB and 16TB) and an optional description. 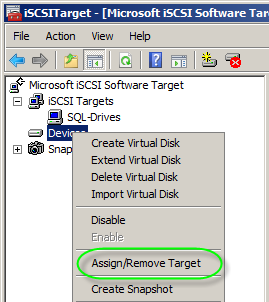 You can also assign the iSCSI Targets at this point, but we’ll skip that and do it as a separate step. 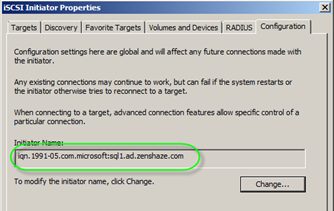 Right-click the “Devices” node in the Microsoft iSCSI Software Target MMC and select the “Assign/Remove Target” option. This will take you directly to the “Target Access” tab in the properties of the virtual disk. Click the “Add” button to pick a target. 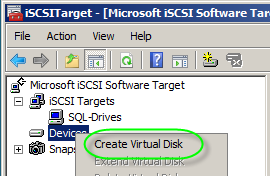 You will typically assign a virtual disk to only one iSCSI Target. 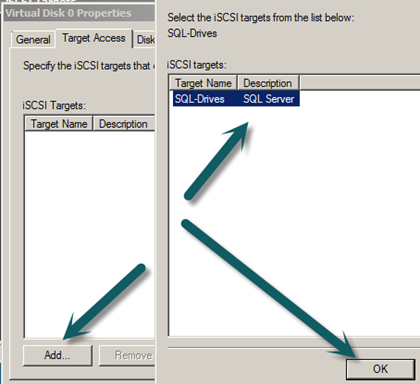 As with multiple iSCSI Initiators per iSCSI Target, if you assign the same disk to multiple iSCSI Targets, there is a potential for conflict if two Application Servers try to access the virtual disk at the same time. Make sure you do that for each Virtual drive you made earlier. 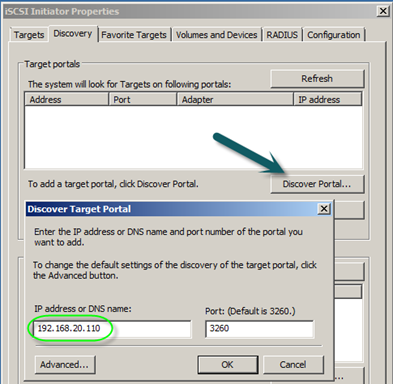 Using the iSCSI Initiator control panel applet, click on the “Discovery” tab and add your Storage Server DNS name or IP address to the list of Target Portals. Keep the default port (3260). The first time I did this I got: Connection Failed. To fix this add a outbound rule for 3260 on the App Servers and an inbound rule for 3260 on the WSS server. Next, select the “Targets” tab and click on the “Refresh” button. 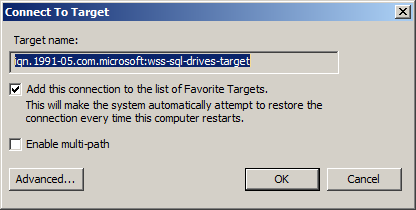 You should see the iQNs of iSCSI Targets that were assigned to this specific iSCSI Initiator. 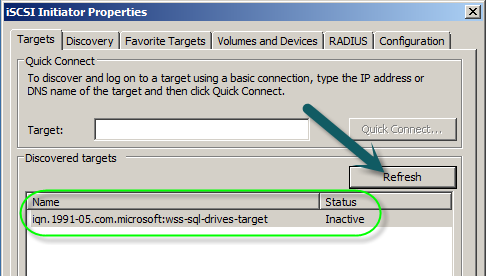 Now you need to select the iSCSI Target and click on the “Log on” button to connect to the target, making sure to select the “Automatically restore this connection when the system boots” option. So there is no “Log on” button in the version I am using but connect should give you the same options. To finish the configuration, open the Computer Management MMC (Start, Administrative Tools, Computer Management or right-click Computer and click Manage). 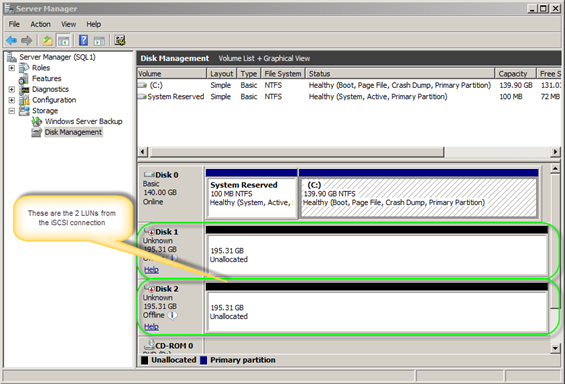 Expand the “Storage” node on the MMC tree to find the “Disk Management” option. When you click on the Disk Management option, you should immediately see the “Initialize and Convert Disk Wizard”. Follow the wizard to initialize the disk, making sure to keep it as a basic disk (as opposed to dynamic). You should then use the Disk management tool to create a partition, format it and mount it (as a drive letter or a path), as you would for any local disk. For larger volumes, you should convert the disk to a GPT disk (right click the disk, select “Convert to GPT Disk”). Do not convert to GPT if you intend to boot from that disk.